Greece is all about summer and sunshine. But if you get the opportunity as I did recently to visit Athens in winter, there is plenty for you to see and do. The weather is mild with temperatures of 13-15C and a higher chance of rain, but hey, it’s not freezing with snow, right? One of the advantages of visiting Athens off-season is that it’s not too hot for all that walking you are going to do around the amazing ancient sites. The Acropolis is worth the visit at this time of year and the entrance fee half price at 10 euros. It is wonderful to re-visit and actually be able to enjoy the atmosphere, without having to avoid the hordes of people I had experienced during a summer visit. As you stand and gaze at the Parthenon, one of the most iconic buildings in the world, it is impossible not to be in awe of the skill and vision of those ancient temple-building Greeks. After you have visited take advantage of the winter price of the Acropolis Museum and wander through this purpose built building gazing in wonder at the artifacts discovered a few feet from where you stand. You can also visit the Ancient Agora, the centre of artistic, spiritual and political life in ancient Athens. The park is dotted with ruins and shady trees, but its jewel is the Temple Of Hephaestus, Greece’s “best-preserved” temple. The view across the parkland to the Acropolis appears unchanged from the view those early Greeks looked upon. If ancient sites are not your cup of tea then Athens has other treats to offer such as the delightful neighborhood of Plaka, situated beneath the Acropolis and its atmosphere similar to a small Greek town, with its winding cobbled streets and colorful houses. It is a touristic area so be prepared for endless shops selling Greek trinkets, silver jewelry, olive wood products and cheap knick-knacks. Nevertheless, at this time of the year it wasn’t unbearably busy and on my walks early in the morning I was often the only tourist on the street! Monastiraki is more of a mix, with plenty of tourists and some locals, and is not quite as picturesque in places but has a great vibe. Of course, it has the shops selling tourists trinkets, but also has the famous Monastiraki flea market which runs from Monastiraki Square. This is more like a bazaar than a market, with shops selling cheap knock-offs next to ones selling handmade leather bags, to quirky stores selling old vinyl LPs, second-hand lighting fixtures, used books and old coins. It is a place to wander and sometimes wish you had a larger carry-on. It never fails to amuse me when wandering Athens streets that one minute you are walking past a stall of cheap trinkets and the next corner brings you face to face with ruins of a building such as Hadrian’s Library, built in AD 132. If shopping is on your to-do list then you’ll love Ermou Street, with all the high street stores. A trip out of the city to the area near the Olympic stadium will take you to the Mall Athens with its plethora of big name stores and it’s only a 30-to-40-minute metro ride from the city centre. Of course, eating can be done in summer and winter and there is no shortage of good restaurants in Athens. Just a plate of Greek salad with its ripe tomatoes and creamy feta will take you to a sunny place. cafés to get a really good cup of coffee such as I Orea Hellas, all to be found in Monastiraki alongside other great eating places. In the Psiri neighborhood try the lovely little meze café, Karamanlidika tou Fani. If it is high-end cuisine you are looking for look no further than the Grande Bretagne hotel and its rooftop restaurant with its stunning view of the Acropolis and superb menu. Of course, after all that eating you’ll need exercise and there are several hills to climb to help work off the calories. 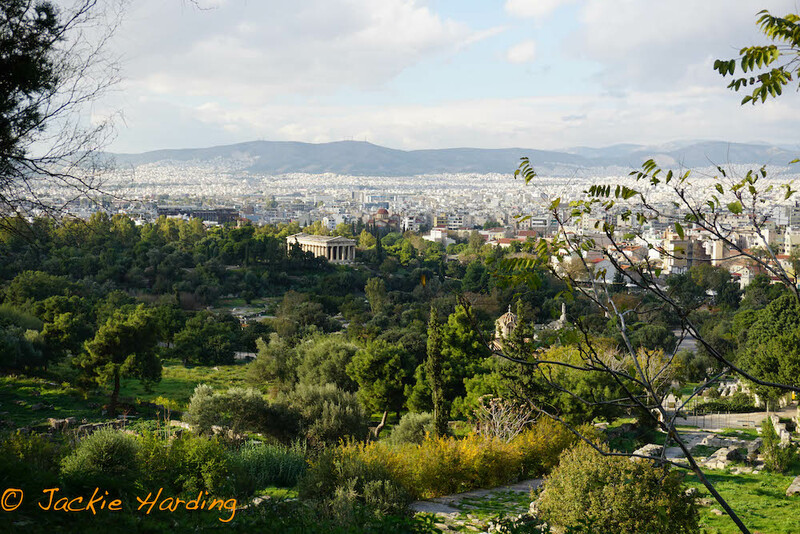 Filopappos Hill is a steep pine-clad hill that will provide stunning views of the sprawling city of Athens and the, comparably tiny, Parthenon as does Areopagus Hill. If you want more of a challenge Lycabettus Hill provides a strenuous hike or you can cheat and use the cable car one (or both!) ways. Athens is, I think, rather like the house of a shabby and feisty old aunt you cannot help but love. It is a massive conurbation that is scruffy, unkempt in places, friendly and chock full of antiquities, rather like that old aunt’s! The best time to visit if you aren’t looking for summer sun is definitely winter ~ then that old aunt can really give you some attention!